Climate change has wide-ranging and complex impacts on environmental systems and the human communities that depend on them. 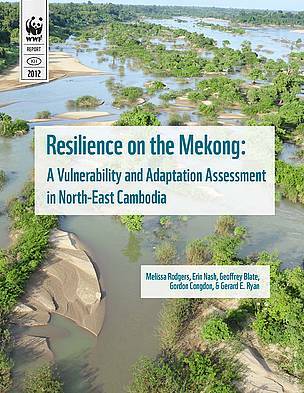 The combined impacts of climate change in addition to non-climatic pressures threaten the livelihood and stability of such communities in the Mekong Flooded Forest, who heavily depend on local natural resources for subsistence. The resilience of nature is the basis for humanity’s own resilience to the pressures of climate change. Responses to climate change should not only improve human communities’ ability to adapt to or cope with changes in climate, but also maintain or enhance ecosystem resilience. Through both community- and expert-based elicitation, this report uses ecosystem-based-adaptation approaches to identify strategies to improve the resilience of the human communities in the Mekong Flooded Forest. • Address the threat from hydropower. This report highlights the need to pair natural resource governance with meaningful community engagement. Grassroots stewardship of the environment is key to maintain resilience to the increasing pressures of climate change.